Every so often, I give in to one of my persistent broodies and let her raise chicks for me. I wasn’t planning to raise any more chicks this year, but couldn’t resist when my cute broody bantam hen became broody again. Typically, my broody hens raise their babies outdoors, but I’ve found that my chicks raised outdoors, with less human interaction, tend to be more skittish around me than those I’ve raised indoors. Since this particular broody bantam hen was so small — about the size of a cockatoo — and I was hoping for very sociable chicks, I decided to experiment and tried keeping the broody bantam hen and her babies indoors for a couple weeks. This way, the babies would receive more attention from the family and learn to love people. It worked! The chicks from my experiment are all friendly, trusting, and love to be held. I figured that since I have kept chicks indoors under a heat lamp in the past, this situation shouldn’t be much different — the broody hen would take the place of the heat lamp and provide the babies with 95 degree heat. In preparation, we set up a large aquarium indoors, on the floor. We placed a nest of shavings on the left side and a chick waterer and a feeder filled with baby chick starter on the right. That evening, I brought my broody Easter Egger Bantam indoors and turned out the lights. I then placed 7 little chicks of varying colors and sizes under her until morning. Broody bantam hen with new babies at the left side of the aquarium. Even though the brooder was set up near my back door, away from the main living area, I wasn’t sure how well this was going to work out, odor-wise. I have a sharp nose and I’m not keen on strong smells. My Pet Chicken does supply diapers for indoor chickens, but a chicken diaper isn’t designed for a broody hen raising tiny chicks. Once again, the small size of the hen was in our favor — this broody bantam hen was not near as messy as a large, standard size chicken. I was able to pick up her smallish poops with tissue a few times a day, which kept the aquarium pretty clean. I didn’t keep my broody bantam hen inside for long, but for those first 12-14 days, she and her brood were content to be indoors – in a fish aquarium. I was also concerned that she might try to jump or fly out of the brooder. 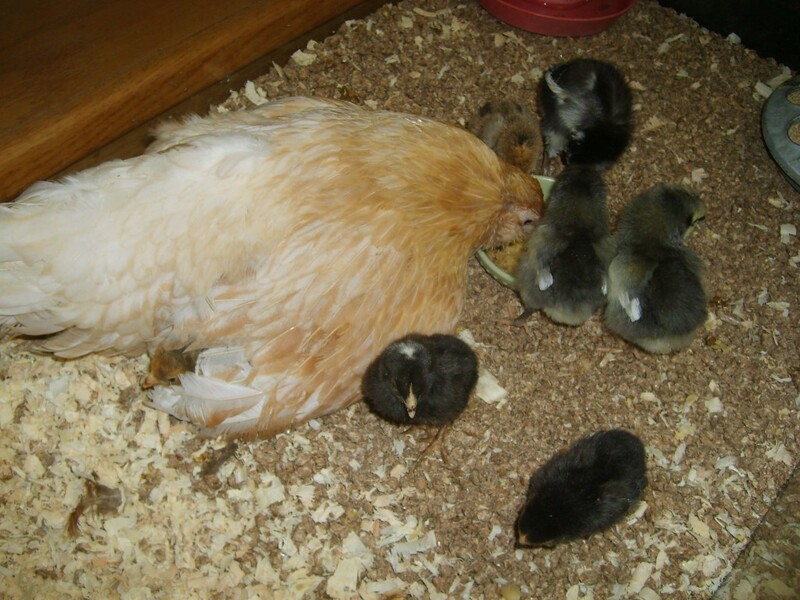 No need to have worried — there was no way this devoted mother was going to leave her chicks. Mama hen showing the babies their treat of soft mash (dampened chick starter). Check out the baby under her right wing, snuggling for warmth. Some broody hens will try to keep their babies away from you, while other hens will let you share in the care-taking. My broody bantam hen is actually one of my more skittish Easter Egger Bantams, but she did wonderfully in this situation and accepted my co-parenting willingly. This little hen taught her chicks that my hand meant more treats and even now, at 5 weeks of age and separated from the hen, they still think my hand is just another mama hen and will try to cuddle underneath it or jump on top of it every time I reach into their brooder. They are much tamer than any other chicks I’ve raised. 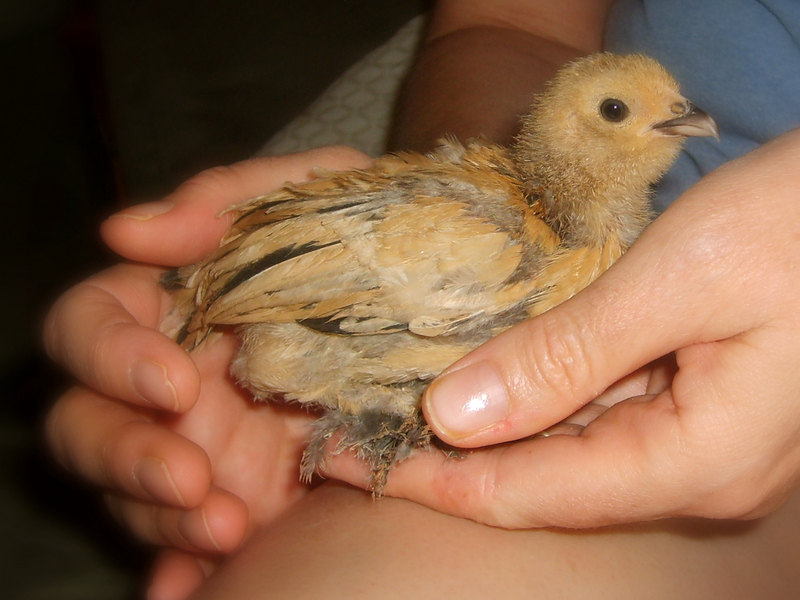 When hatching eggs under a broody, there are a few things you can try for cuddlier chicks. If you have a choice, choosing a friendly, docile broody that trusts you should result in tamer chicks, as long as you make sure to handle the chicks regularly. Touching and handling the baby chicks is a great way to get them used to you and will not interfere with the hen’s instinct to care for her babies. 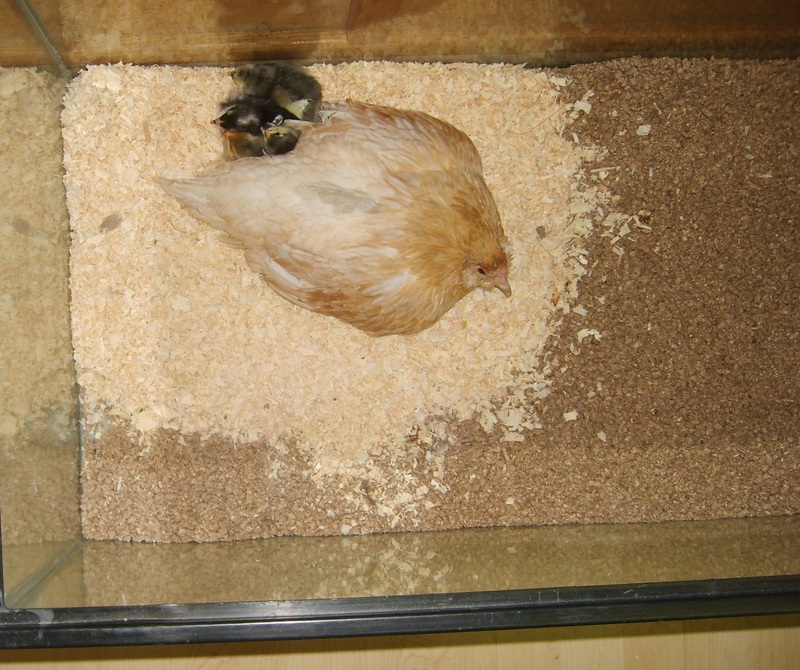 You can try bringing a broody bantam hen inside for a week or two, so that she and the chicks learn to trust you more. Being the giver of treats, once they are old enough, is always helpful too. Do you have any broody hen tips or personal experiences with broody bantams or indoor broodies? If so, please share in the comment section below. « Fallen feathers–what to do with them? I have four buff orpingtons witch are as far as I know the fattest chickens in the world. They are not very tame but they are the best mothers you could ever ask for I highly advise you get some! I have 3 banties 2 are sitting on regular sized eggs. Im afraid they are not going to hatch. It IS true that not all eggs will hatch, but if you’re worried about the fact that they’re bantam mother hens, don’t. Bantams can hatch large fowl eggs at generally the same hatch success as they hatch bantam sized eggs. Actually conservationists often use Bantam chickens, Silkies in particular to hatch out difficult eggs when trying to preserve endangered species being breed in captivity when the mom bird fails to brood. The strong brooding instincts in bantams makes this possible. And yep they can and will brood eggs from larger birds successfully.